I am grateful to destiny for leading us to this book. I am duly presenting it here. As my 7 year old promptly adds Paddle-to-the-sea to her list of favorites, I see us both recommending and reading this book several times in the future, and not many books are that compelling. Thus begins Paddle’s aquatic journey. The destination is the ocean, Atlantic Ocean. The small river where he sets off eventually leads him to the Great Lakes – the five lakes - Superior, Michigan, Huron, Erie and Ontario. Transiting through the St.Lawrence river to Newfoundland, he journeys to the ocean. Each chapter celebrates an encounter, a gamble, a risk. Sometimes it is a slow struggle. Sometimes it is a quick squirm out. Most times Paddle is just plain lucky. Interspersed are passages of serenity, nothing but the quietness of the still water or the murmur of a brook. It is not an easy ride for Paddle. He rides a log into a saw mill and escapes by the skin of his teeth. He gets trapped in a marsh. He weathers wind and rain and storms to keep sailing. Sometimes he is washed ashore and later tossed back into the lakes. He even finds himself netted. Passing many pairs of human hands, the message underneath constantly evolves. Paddle also spends a winter with a coastguard. Then there is the wrong detour and the forest fire... he even nosedives in the Niagara Falls. Rivers, lakes, streams, creeks, beaches and bays – Paddle meets every body of water on his trip. What makes this book wondrous is that every textual page on the left carries informative black-and-white diagrams. Sometimes with little hand written notes and markings. This helps a lot with mastering the topographical details of the lakes and the region, and with visualizing the details of Paddle's intricate risks – be it a saw mill, a canal lock, a lake freighter or a buoy. All these also fuel a sense of proximity to the chaos that we often see on a dock or by the pier. Like these aren’t enough to get ourselves entangled with Paddle and his nail biting water adventures, the pictures on the right burst with color, in striking images of the sky, lakes, wilderness, woods, boats, birds and Paddle himself. A chapter runs a page, making it a great transitional book for younger readers. It is an engaging resource for learning about the Great Lakes and thus makes wonderful classroom material. The visual support we get through maps, trail markings, one-liner-facts and detailed drawings with named parts is invaluable. It is great literature, in print for generations to learn and enjoy. Offer it to a child who is ready for this kind of a package. 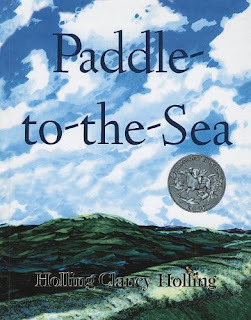 More of Holling's geo-historic fiction that tell the story of a journey while celebrating nature are Seabird, Minn of the Mississippi, Pagoo and Tree in the trail. Fabulous review and a fantastic pick Meera ! What a perfect book which covers water in all it's myriad forms. I am definitely going to pick this book for both the kids at home. Nice, Meera. Try Julie of the Wolves. Meera, I feel as if I want to have this book in my hands NOW! I'm sure most others reading it will feel the same. You have brought alive the journey of Paddle,(and of water) from the snow mound to (hopefully) the sea. Wonderful! @Tulika: 'Julie of the Wolves' is certainly on my wishlist, esp. since Choxbox has recommended it highly some time back. This book also brings to mind American classics like Huckleberry Finn with its action on the Missisippi river. "I am grateful to destiny for leading us to this book." All the adventures Paddle-to-the-Sea goes through! How exciting! Sounds like a real treat. Can't wait to lay my hands on this one. Fabulous pick Meera. Wow. This is defly. one of those one of a rare kind books. I hope to read it soon to the boys. What a brilliant review of a brilliant-sounding book! @TuliakBooks: Heartily joining you in reco-ing Julie of the Wolves. Would recommend parent reading it forst Meera, in case of a 7-year old though. Most okay, but like we'd discussed on ST, a tiny part of it may not be appropriate for that age. The two sequels are also great. Flipkart delivered them in 2 days! Paddle reminds me of the Red Balloon. Something about stories/movies where the main character is an "object". The genius of the artist who created the story shines when the reader starts feeling for the inanimate filled with a personality of its own. This one seems like fantasy mixed with escape capturing the sheer innocence and delights of childhood...for some reason, since childhood, anytime I looked up at the sky, my heart always went out to the one lonesome, wandering cloud that tried "hangin' out". Thank you R, Sandhya, Tharini, utbt, Vibs,chox, P and A! Yes, let me know how it goes if you get a chance to read it. Tulika: Thank you! Yes, we love Jean Craighead!! We've read many of his books picture books like "Snowboard Twist" and "The Last Polar bear". Haven't started YA books yet....have seen Julie of the Wolves, and hope to read it sometime! Thanks for mentioning it.